This is a work in progress and may contain errors that shall be corrected in the near future. I am uploading the data I have so far, even incomplete, just to be seen for possible descendants. Pokemunski genealogical tree, click to enlarge. 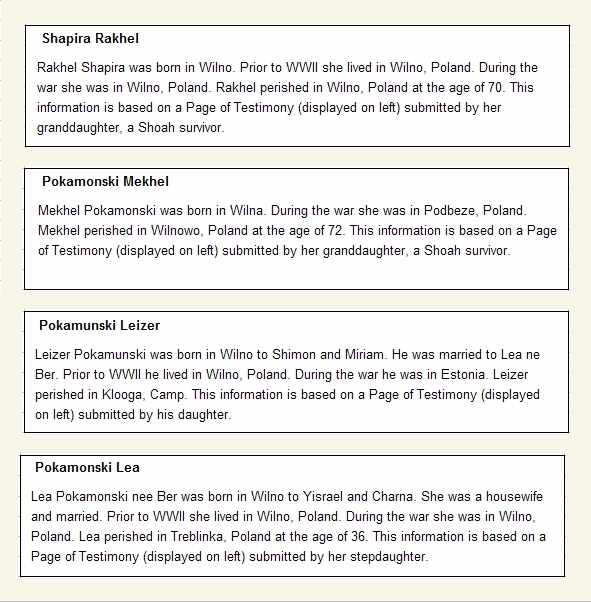 My auntie Nelly told me that she thinks that the Pokemunskis were 7 siblings: No data about their mother and found out that the father might have been Leizer Chaim Pokamonski, that sounds very credible to me, as my grandfather (Leizeres Haim) was probably named after him. On reading Yad Vashem, I found out a Shimon married to a Mekhel (Miriam) that perished in the Holocaust. 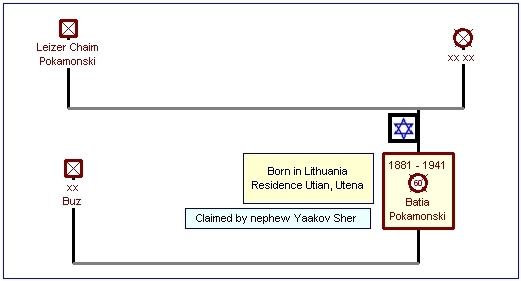 They had a son named Leizer (also named after his grandfather Leizer Chaim as my own grandfather, his cousin?) Leizer was born in 1897 and married to Fania and later to Lea. Leizer, his mother Mekhel, his second wife Lea and four of his children were murdered in the Holocaust. Only a girl named Rivka survived. There is a possibility that Leizer had more siblings, one of them named Chona that later on migrated to Argentina. 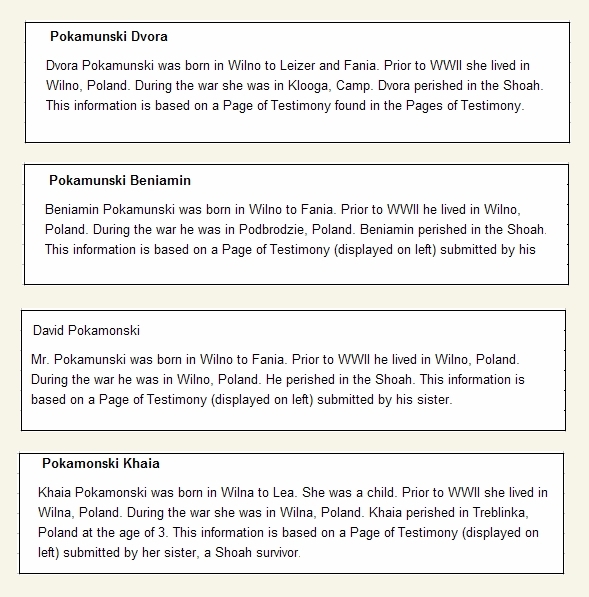 Shimon Pokemunski genealogical tree, click to enlarge. Yad Vashem, click to enlarge. He was born the 13th of April 1898 and passed away in Florida, United States, at 79, in February 1978. The family lived in Argentina and I wonder if they were in touch with their cousins, my grandfather Leizer and his brother Sepseris. He married Rebecca, born in 1908. She passed away in La Plata, Argentina, the 18th of May 1971. They have two children, male and female,both married and living in Israel. I was able to find the email address of the wife of him, and wrote to her. Said she was happy to hear about family and then stop writing. I will wait a prudential time and to try to connect again. 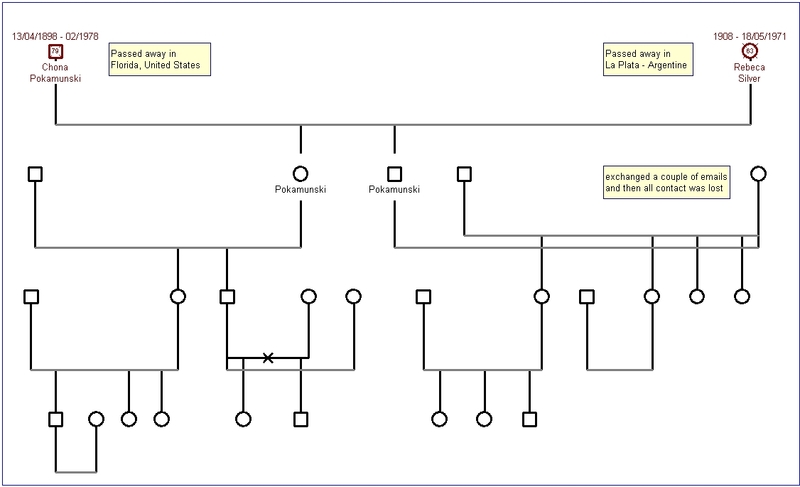 Chona Pokamonski genealogical tree, click to enlarge. Married a Buz, quite a large family to be investigated. 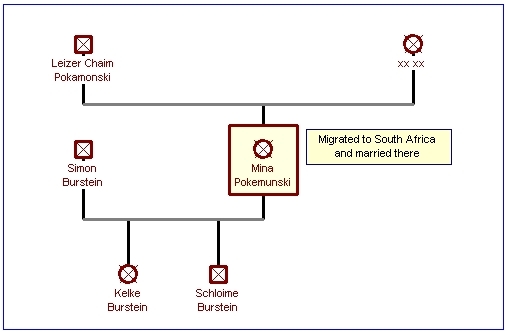 She was single and raised her nephew Sepseris (Sasha Gorfain) Later on, when Sasha was a youngster, Mina migrated to South Africa, married to Simon Burstein and had her own children: Kelke and Shloime. Mina was the godmother of my auntie Nelly and she remembers receiving correspondence when they were children. Later on, they lost contact and most probably we have a large Pokemunski family there, but very difficult to trace. She was my g-great mother. She married Sleine Gorfain (my g-grandfather). He passed away at a very early age, leaving a widow and 4 children, the youngest, Sasha of one year old. Being a widow, she married Sroel Glezer that was a glazier and also a money-lender A widower himself, Sroel came to the marriage with two sons. When Mina migrated, (I guess it was circa 1915-1916), Sasha's brother Leizeres was already married and he went to live with him. By that time he did get along with his stepfather Sroel, who taught him the glazier's trade. Also DID Leizeres. 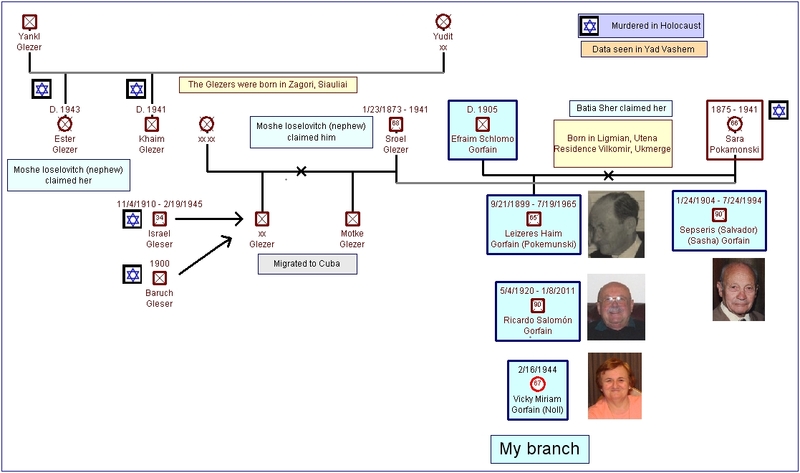 Sara Pokemunski genealogical tree, click to enlarge. 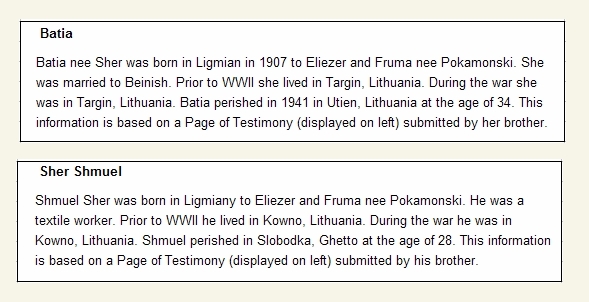 From the Pokemunski s side, Leizeres had cousins. One of them was surnamed Shapiro and they had also migrated to Uruguay and the families were in close contact. Most probably they were the pioneer s immigrants, that, being the reason of Sasha coming to Uruguay too in 1929 and finally Leizeres settling here in 1930. The Shapiro's had a fur boutique in a very well known street of Montevideo (Andes street). So far I have been unable to find their descendants, who were my father's second cousins. My auntie Nelly also recalls that about the 1940's a very known violinist came to Uruguay, and her father received a ticket to go and see him performed, as he was a second cousin: Jascha Heifetz (the famous one). She also recalls seeing a picture of both of them, but it could not be found. I have read thousands of articles about him, but could not find the link. There is a database that contains lists of over 15,000 Vilnius Ghetto prisoners, from a census of Lithuania in May 1942, taken from a book published bythe Vilna Gaon Museum in Vilnius, Lithuania in 1996. 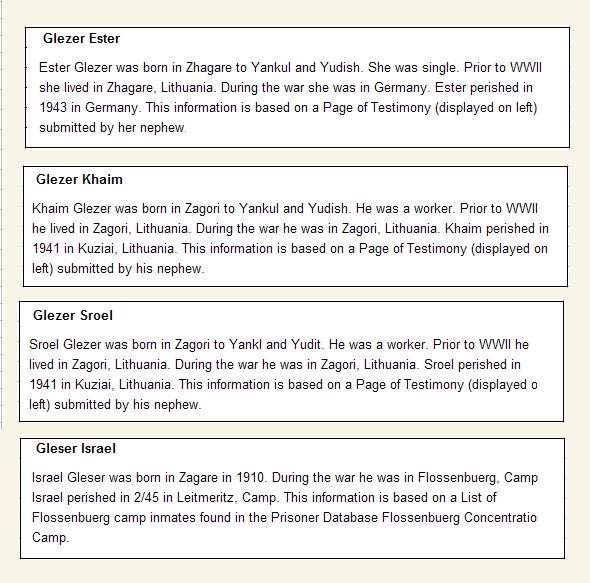 One of this victims was Glezer, Izrael, born 1873, January 23rd. According to his nepehw, he perished in 1941, but according to this book, he was still a prisoner in 1942. 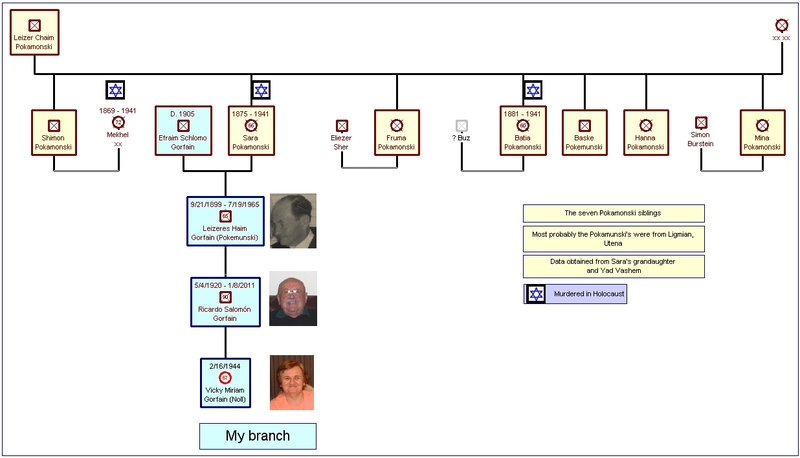 The Glezers genealogical tree, click to enlarge. When we were children, we used to call my grandfather with the nickname: old Pokemunski . He was very fond of music and I do remember that his favorite one was The Bumblebee .